In 1974, Andrew Colaruotolo planted a few acres of vines on a hilltop in Fairport, NY with plans to make wine for his friends and family. Almost 45 years later, his vineyard has expanded to over 40 acres and produces of 35 varieties of wine. In honor of Mr. C, we have hand-selected grapes from Block 1, that very first block of our vineyard, to celebrate his legacy and his love of wine. Viticulture notes. 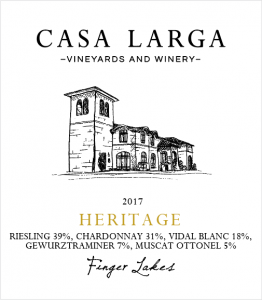 We hand selected 5 different varietals from our oldest block in the vineyard to display the strong flavors and rich history of Casa Larga. The vines were closely tended in order to promote enhanced sun contact and ripening. Winemaking notes. The grapes were hand selected to achieve peak ripeness, and then pressed, fermented and aged together simultaneously. Fermentation occurs at very low temperature in stainless steel tanks and the wine is then bottled young to preserve its fresh, vibrant, flavors. At CasaLarga.com for direct shipment to residences and workplaces in 40 states & DC. Aging. Store at cool temperature (55º-60ºF) and out of direct sunlight. Tasting notes. A slightly floral nose followed by subtle green apple & lemon citrus finish. A smooth finish punctuated by a touch natural acidity. Pairing suggestions. Antipasti, light cheeses & melons like honeydew & cantaloupe. Pasta dishes as well as scallops, sea bass & other fresh water seafood.